The Omnicom agency got the attention of the NBC morning show, and some of its neighbors, when it joined a Midtown back and forth over an Adele mega-hit. Hello, Kathie Lee and Hoda. The Adele mega-hit "Hello" got Marina Maher Communications a high-profile mention on Today on Tuesday morning, after the firm engaged in some friendly back and forth with neighboring businesses featuring the song’s lyrics. 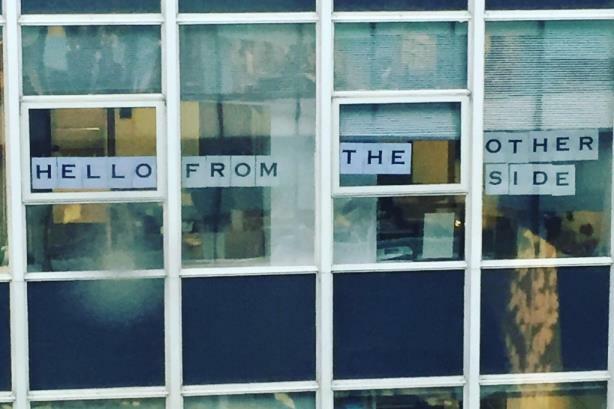 Discovery Communications, located across the street from the Midtown-based firm, initiated what MMC coined on social media as the #AdeleWorkWars when it pasted the lyrics, "Hello from the other side," on its office windows. Marina Maher staffers replied by spelling out the reply, "I must have called a thousand times," on its own windows. A third neighboring business joined in with, "To tell you I’m sorry." And the "wars" continued. Kathie Lee Gifford and Hoda Kotb gave the PR firm a shout out on Today on Tuesday morning. Gifford quipped, "How long is this song? This could go on for a while." Marina Maher Communications tweeted about window banter, claiming victory.